Thanks to social networking sites like Twitter and Facebook, charity is moving beyond direct mail, newsletters, and door-to-door campaigns. It has gone “non-traditional” – and so have forms of giving. What d’ya know: social media has churned out something we may aptly refer to as ‘social good’. This came to record-setting light in the recent #BeatCancer campaign. You might have heard of it. Actually, you may have participated in it. Here’s how the fundraising effort went. 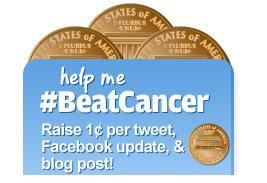 For every Tweet, Facebook status update, or blog post containing the #BeatCancer hashtag, eBay/PayPal and MillerCoors pledged to donate one cent to cancer research. The campaign went viral, mobilizing raised social media users everywhere. On October 16 to 17, #BeatCancer raised significant money for several cancer charities – to the tune of over $70,000, actually – and set the Guinness World record for the most social mentions in a 24-hour duration: 209,771. Amy Cowen’s personal fundraising campaign: When Cowen’s sister, Jessica, was told by doctors that she needed a kidney transplant, Amy set out to raise funds for the operation by reaching out to her network on Facebook. “It just spread like wildfire,” she said. “Complete strangers were donating money and sending messages of hope.” In addition, Amy created a page for her sister, “Help Jess”, at GiveForward, which allows individuals to raise money for their causes. Amy was able to raise over $44,000! Yahoo! for Good: Thanks to the rise of social media, the concept of corporate social responsibility has evolved. Yahoo! partnered with charity aggregator Network for Good to launch a personalized Charity Badge for people to put on their blogs, social networks, and even E-mail. The user who generated the largest number of individual donations from their personal social network – an amount that eventually went up to $50,000 – was matched by Yahoo!. Typhoon Ketsana relief operations: Facebook and Twitter became the lifeline for Filipinos in Manila as well as all over the world when typhoon Ketsana hit the Philippine capital. They used social media to track friends and relatives in deadly floods caused by the heavy rains. Tweets, Facebook updates, and even YouTube videos contained links to organizations where one can give donations, like the Philippine National Red Cross and TXTPower, the latter of which raised close to $37,000. 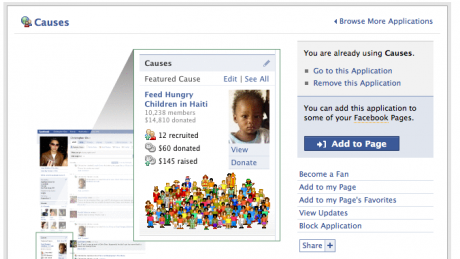 Facebook Causes: Launched last May by social action group Project Agape, “Causes” lets users create online communities to advocate for various issues, charities, and political candidates. It empowers individuals with a good idea or the passion for change to positively impact the world. The application has since then attracted over 2.5 million Facebook users and raised over $300,000 for a variety of causes. Meanwhile, the Facebook application (Lil) Green Patch lets users support the rain forest by tending a virtual garden; the game has raised $210,000 for the Adopt an Acre program of the Nature Conservancy. Internet has embraced social media, and consequently, the most popular networking sites have emerged as new platforms for charity. According to a study by the University of Massachusetts Dartmouth Center for Marketing Research, 89 percent of 200 charities surveyed are now using social media to raise money. It’s not just because the method of doing it online cuts costs; it’s because givers are aplenty in social media networks on the web and they are influencing their social network to do the same.